Can You Make Money In MLM? A lot of people ask me, "Is it really possible to make money in MLM"? That is a really good question. One that I get asked almost every single day. People really wonder. Can MLM help them to realize all of their dreams, goals and desires? Can MLM help them to pay off their mortgages, or pay off their credit card debts? For most people, they all have pretty much the same desires. They want to be financially free. What exactly does that mean to be financially free? One weekend when I was attending a Millionaire Mind Intensive weekend, one of the speakers defined what it meant to be financially free. And once I heard the definition, it seemed so much easier than I had imagined before. Thank God I attended that seminar, because it totallly changed my belief about what it would take to become financially free. To be financially free it means that you have more money coming in each month than the total cost of your bills whether you are working or not. Once I realized this definition, it became so much more attainable to reach. Many people put such a high number on financial freedom, that they never feel like it's even possible to attain. Once you put this new definition on financial freedom, creating a residual income in MLM of maybe $5000 a month would actually be financially free. Now can you see how attainable it can become to be financially free in MLM? I hope that this concept will shed some new light on the subject for you too! It sure changed my perspective instantly and helped propel me to become a top recruiter in MLM. Read more about the topic - Can You Make And Money In MLM. Learn the marketing strategies that will have your phone ringing with incoming phonecalls for your MLM. 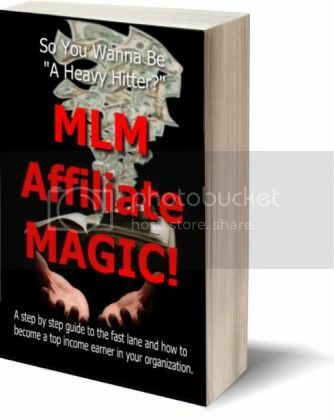 For a limited time we will be giving away a 104 page training manual called MLM Affiliate Magic that explains step by step how to generate 20 to 50 leads per day. This is a $197 Value and it's yours free just for subscribing to our news letter. There is a limited supply so ACT NOW!